Figures released by the British Association for Screen Entertainment (BASE) based on data from The Official Charts Company and IHS Markit show that UK consumer spend in the video category rose by 2.2% in 2016 bringing the total value of the category to £2.25 billion (€2.63bn). While ownership remains vital to the category and represents a massive 49% of category value, 2016 has also seen rental, or streaming overtake ownership, with 51% of value coming from consumers choosing to rent or stream. Digital video services continued to show strong growth in 2016 increasing 23% year-on-year and furthermore the overall audio-visual industry grew 5.9% across the year to a massive £10.98 billion. 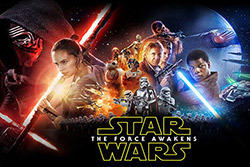 Star Wars: The Force Awakens lead the sales of the category with over 2.3 million copies passing through physical and digital retail, making it the best-selling video title of the year. According to BASE, the format sales breakdown of Star Wars: The Force Awakens illustrates that consumers are taking full advantage of the format choice from the industry, with 51.5% purchasing on DVD, 34.4% Blu-ray and 14.1% Digital. Following the blockbuster’s success, other top successes in the film category included James Bond’s Spectre and Ryan Reynolds’ anti-hero Deadpool both selling through over one million copies and each approaching sales of over a quarter of a million digital copies. Universal Pictures Home Entertainment, had another stellar year, dominating both value and volume market share, taking 20.2% share of volume and 18.5% share of value. Universal in 2016 has had the largest number of titles – 38 –to surpass 100k unit sales of any distributor. Twentieth Century Fox Home Entertainment UK led the Blu-ray market with 20.8% in volume and 21.2% in value share thanks to the combined success of Spectre, Deadpool, The Martian and The Revenant. BASE says further appetite for high quality content was demonstrated by consumers as early adopters bought into the 4K UHD market. The category has now released 96 titles into the market on this new format, with Deadpool from Twentieth Century Fox Home Entertainment UK, proving to be the most popular selling through over eleven thousand units. 2016 has been a year of particularly high quality British drama, The Night Manager from Sony has sold through 130,000 copies in 40 weeks, while ITV’s Victoria sold 54,000 copies in 12 weeks and War & Peace from the BBC has sold 50,000 copies in 47 weeks. While ITV’s new version of the vintage masterpiece Poldark continued to sell at a great rate, selling through 40,000 copies in 2016. 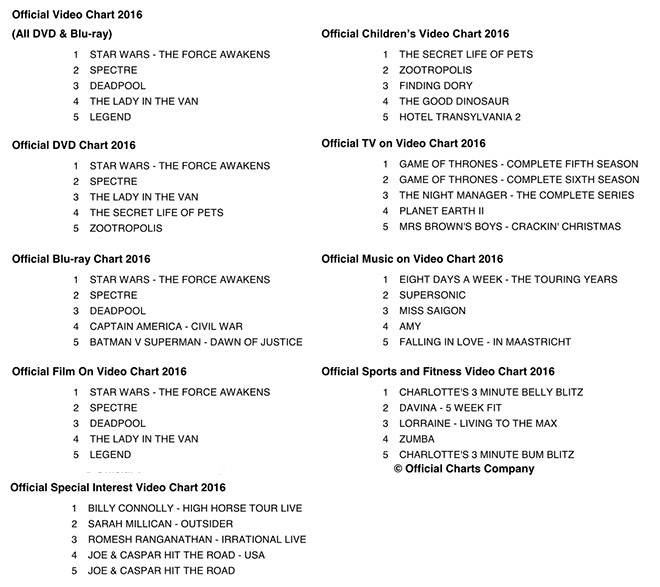 Across other Official Video Chart genres, Universal Pictures took the leading spot for Children’s title with The Secret Life of Pets, while Ron Howard’s Beatles film, Eight Days a Week – The Touring Years, from StudioCanal (distributed by Elevation Sales) topped the Official Music on Video Chart in 2016.